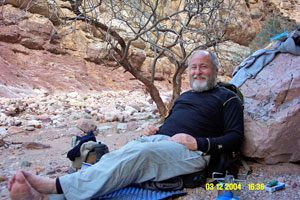 Since retirement, Mike continues to work with Arizona State University and Grand Canyon National Park on certain projects and even teaches classes occasionally. That and reviewing professional papers, there’s no chance Mike’s skills will get rusty anytime soon. So much for retirement! Mike is the author of three canyon histories, all published by the Grand Canyon Conservancy (formerly Grand Canyon Association): Living at the Edge: Explorers, Exploiters and Settlers of the Grand Canyon Region, 1998; Polishing the Jewel: An Administrative History of Grand Canyon National Park, 2000; and Along the Rim: A Guide to Grand Canyon’s South Rim from Hermits Rest to Desert View. Mike served as project director for Grand Canyon’s first history symposium in January 2002, and compiled and edited the proceedings for publication by Grand Canyon Conservancy, entitled A Gathering of Grand Canyon Historians, published by GCC in November 2005. His work also includes nominations of Grand Canyon’s trails to the National Register of Historic Places, Historic American Engineering reports of the canyon’s historic roads (available at the Library of Congress), and articles in Grand Canyon Nature Notes and the GCC newsletter, Canyon Views. When not exploring Grand Canyon’s roads and trails, Mike is often teaching history to park interpreters and other park staff, and NAU and Yavapai College Elderhostel (now Road Scholar) groups. In 2005 the Grand Canyon Historical Society honored him for his contributions to canyon historiography with the society’s pioneer award.